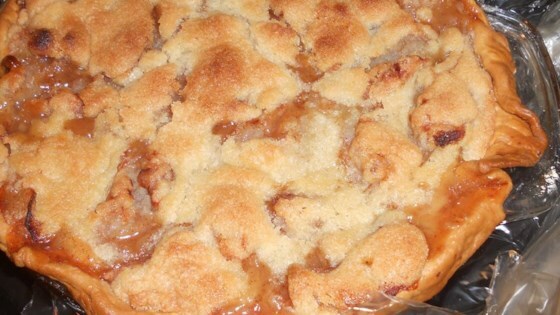 "My grandmother used to make this pie when we had Christmas at her house. She used a paper bag to cover the pie, but in the updated version we use parchment paper. It is a very old recipe. Enjoy!" Preheat oven to 425 degrees F(220 degrees C). Place apple chunks in a large bowl. Combine 1/2 cup sugar, 2 tablespoons flour, and nutmeg. Sprinkle over apples and toss to coat well. Spoon into pastry shell. Drizzle with lemon juice. For the topping: Combine 1/2 cup sugar, and 1/2 cup flour. Cut in butter. Sprinkle over apples to cover top. Take two 15 inch pieces of parchment paper and enclose pie; fold edges up 3 times. Place on a baking sheet. Bake for 1 hour. Remove from oven, split parchment open and cool pie on wire rack. DO NOT open parchment covering while baking! Cool for 10 minutes before serving hot. Absolutly amazing! This recipie is great even with a store bought crust! terrific balance beteween sweet and savory! This was my first apple pie and it came out exactly the way it should have. Everyone in the family enjoyed it. I even added 1 tablespoon of ground cinnamon for my special tastes. You can't go wrong with recipe. It turned out great and the parchment papers saves on oven mess. Instead of using parchment paper, I put the pie in a brown grocery bag. I sprinkled a bit of water on the top of the bag and baked as directed. Much less fuss! I didn't have a paper bag so I used a turkey oven roasting bag worked great delish!